Rigde Maha Guru Chhoetshok is a body with a modern approach to teach the Buddhist philosophy and educating the young and old coming from all walks of life, especially the younger generations who share greater responsibilities with the nation. My prior intention to open this retreat centre is to support the dreams of GNH, by minimizing the problems related to youth, social and political issues, which I hope will bring about peace and prosperity not only in the nation but in the world at large. It is to all our knowledge that all the unwholesome actions are an ultimate result of unwholesome thought. All the suffering is the result of unwholesome actions. A thought good or bad is generated from our own mind. Therefore, taming one’s own single mind can put to the end of all the worldly sufferings. Thus, this retreat centre will play a vital role in taming the minds of people in this life itself. Today the world is going through a big turmoil. Every human thought is carried away by the materialistic world. People have no time to practice dharma, which is the only way to happiness. Santi Deva has rightly said, "Root cause of all the sufferings is generated from one's own desire..." So only the way to happiness is through meditation and practice dharma - Thinking of other’s happiness which in return makes you happy forever. I hope this retreat centre will benefit all the motherly sentient beings to realize one’s own true nature of bodhisattva and achieve the eternal happiness in all times to come. "May the peace prevail on Earth"
"May all of us achieve enlightenment"
"Let us take steps together to fulfill all our dreams"
"Make a nice days ahead"
RMGC aspires to become a well-endowed and dynamic religious society organization that will exist in perpetuity to preserve, protect and propagate the Buddha Dharma in Bhutan and around the world in tandem with the changing dynamic of times. To mobilize funds and strengthen its resources base as well as organizational structure to carry out lawful and prudent investment of its capital and resources and govern the judicious use and management of all its assets and resources to ensure the long term sustainability of the monastic centres and institutions established by Jigme Rigdzin Rinpoche or being looked after by him now and in the future. 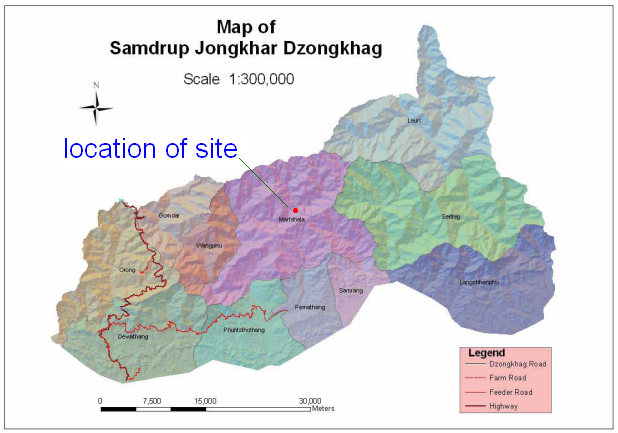 The site is a privately owned 15 acres area in the beautiful mountain area at Sarjung Village, Martshala Gewog, Samdrup Jongkhar district. The proposed location is connected with water supply & electricity. It is high up on the hill at 1200m above sea level, elevation with warm in summer & moderate in winter. Currently the site can be accessed on foot from the nearest road in 1 hour.